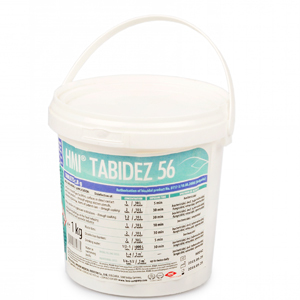 Chlorine based biocide, purposed for disinfection of surfaces with wide spectrum of activity, available in the form of granules, tablets and effervescent tablets. AREA OF APPLICATION: Highly effective chlorine based preparation in the form of granules and effervescent tablets for disinfection of washable surfaces in medical institutions, objects with communal purpose, kitchen surfaces and equipment and installations in manufacturing and food-trade objects. Easily and precisely dosed and stable at normal storage conditions.